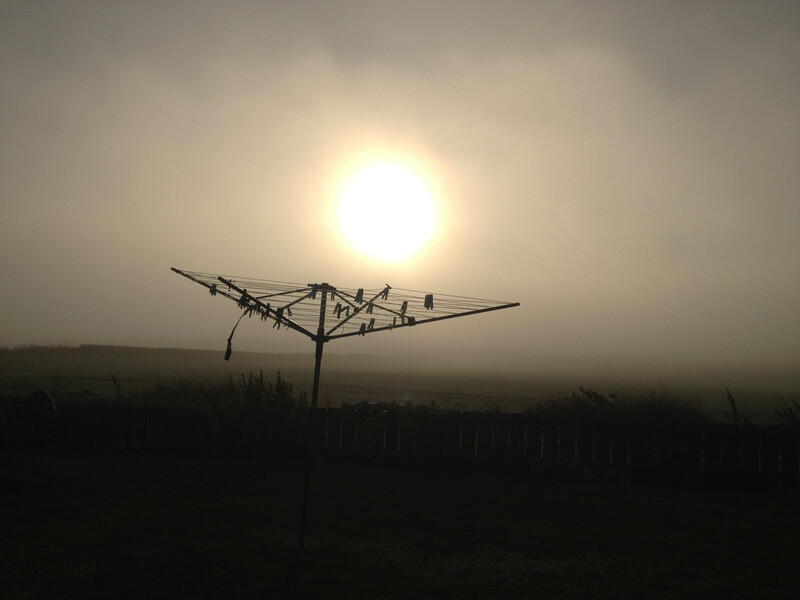 There has been dense fog over much of Britain for the last week or so – not cold, just moist and very misty. You can sense the sun is trying to break through. And there have been days when the sun has actually broken through … even if it is only for a little time. So when the weather forecasters said the sun might break through on the Northumberland coast, and we saw that the tides were convenient (so to speak), we decided yesterday was the day for a walk round Holy Island. 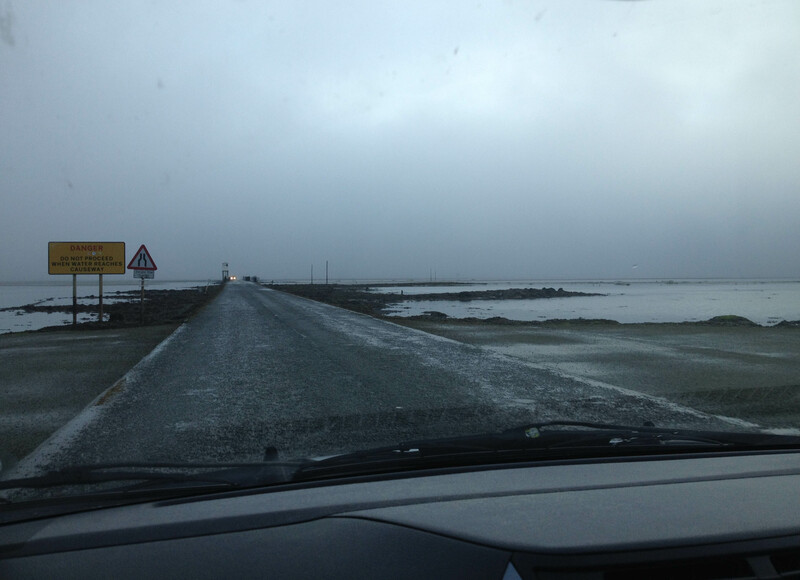 Crossing the causeway was forbidding: the fog was deepening. The car park – not surprisingly for a grey foggy day at the beginning of November was almost empty. (Contrast this with our summer visit several months ago.) It wasn’t cold – just very damp, very grey, and not a little bit disappointing. But we’d set the day aside for this walk, so better make the most of it. And how very rewarding it turned out to be. With so much mist – such limited vision – you see things differently. Dark, decaying plants stood out strongly. Colours – even the smallest patch of gold lichen on the wall – leapt out at us. 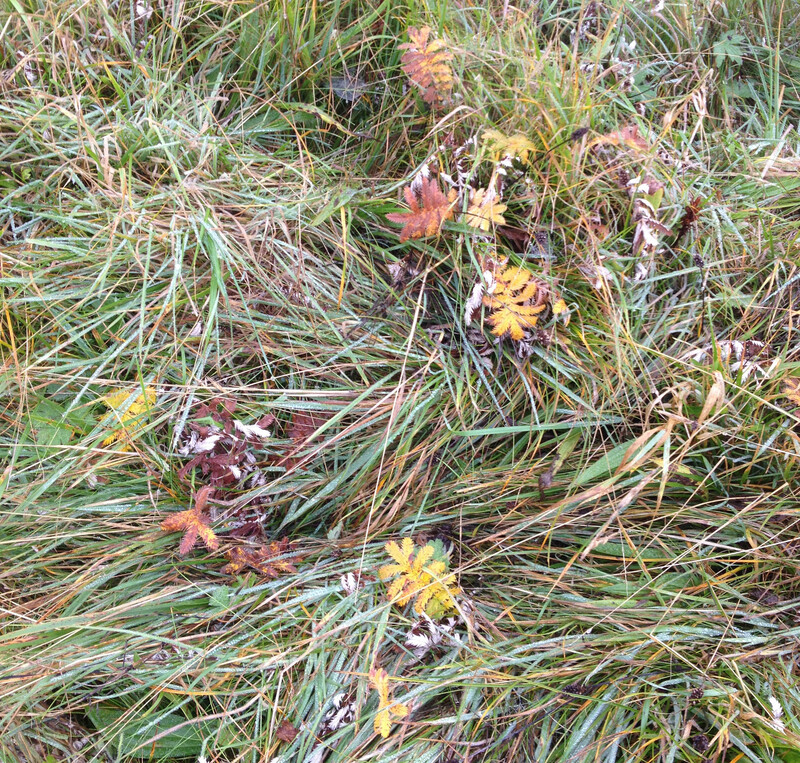 Plants that had been silver earlier in the year were now turning gold. 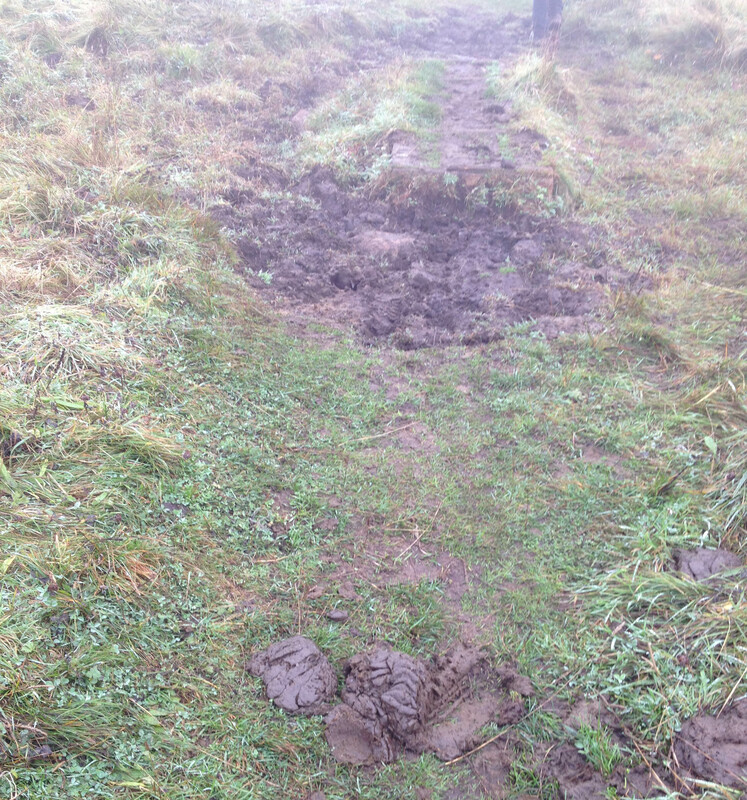 There were clearly cattle around – much evidence of them: the ground churned up, cow pats. But we never saw them. I was imagining how they would look looming through the mist. 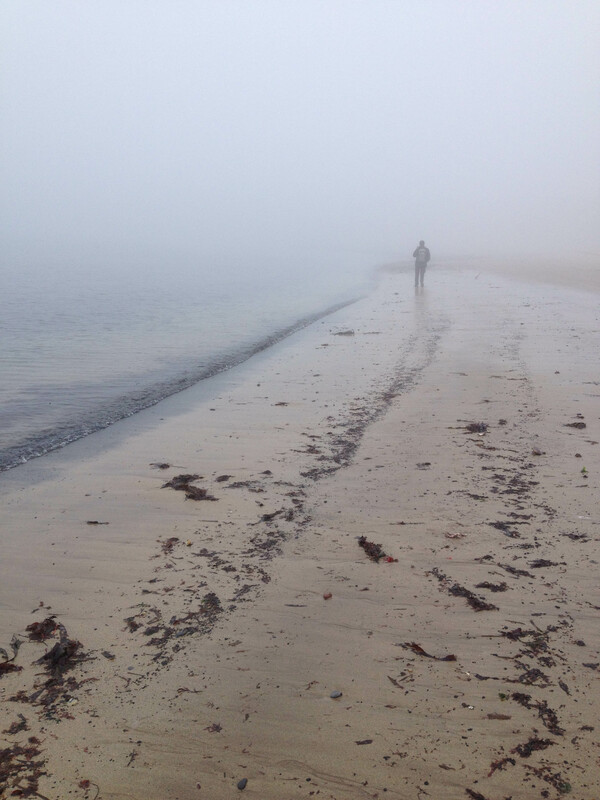 Would the mist lift when we got to the beach. 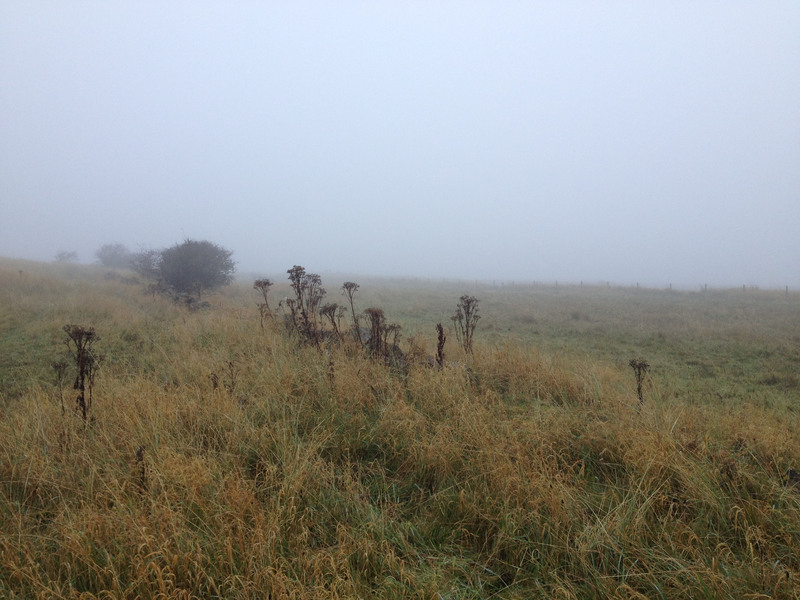 No, far from it – the fog was denser there than ever! 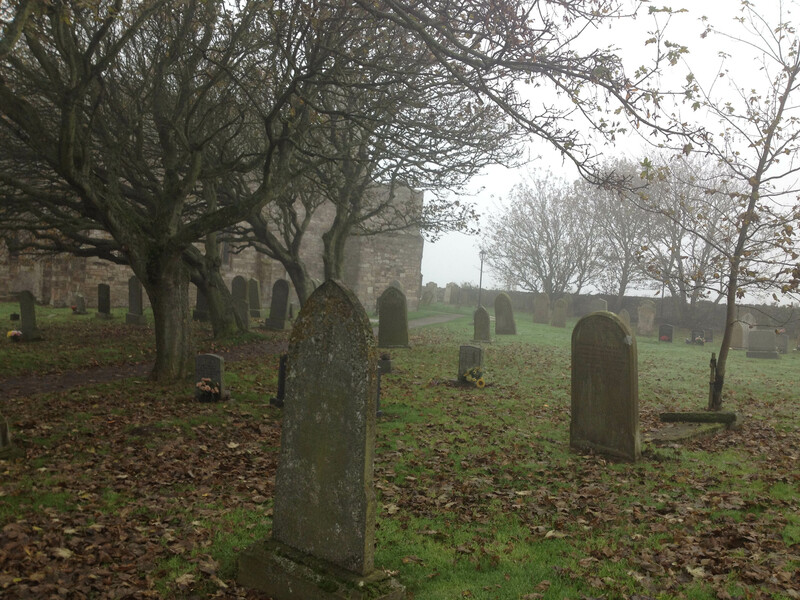 What I can’t convey with these pictures is how haunting the sounds were as we walked round the island. And nowhere more so than on the beach. We found – and heard – a couple of curlews amid a plenty of gulls – and our favourite little sanderlings (for whom we have set out searching before). 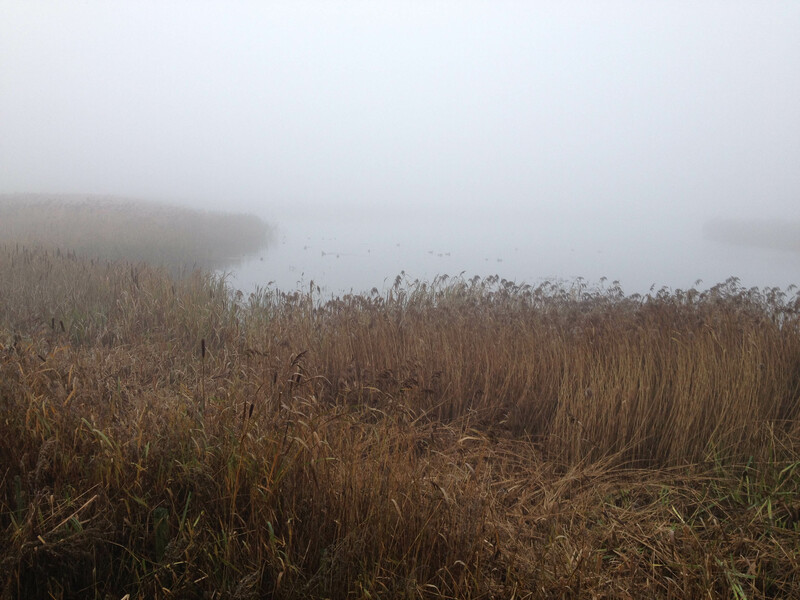 This was the view – or lack of it – from the hide. It’s usually busy here with people settled in to watch the water birds. But yesterday? Nobody else – just the water birds busy and noisy. What colours and splendour of bullrushes! We met nobody else on the walk – until we had passed this hide. The sense of walking in the pervasive grey and damp with just bird calls floating out and about was extraordinary. 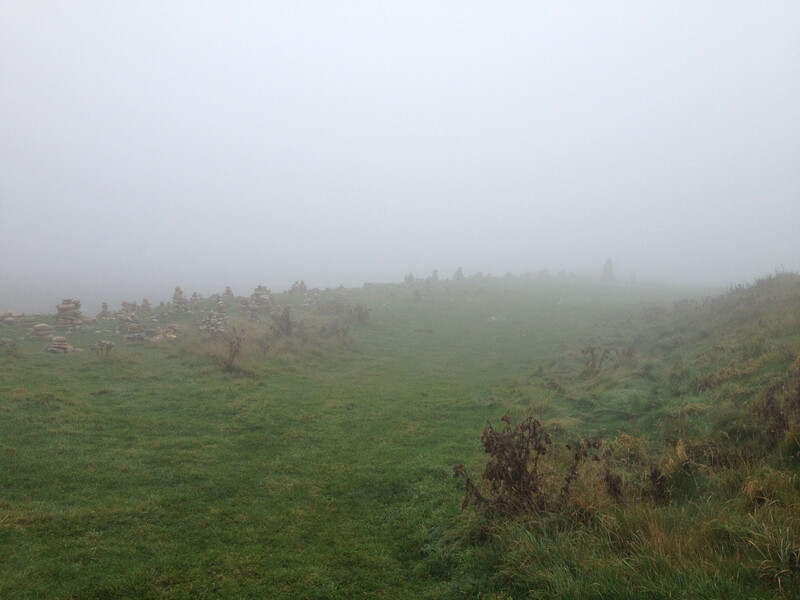 As we drew near to the castle, we passed the cairns shrouded in mist. Visitors construct these out of local stones – in memory of loved ones or perhaps for fun? I don’t know. Today they were beautiful and mysterious. Somebody had left a message … And then we approached the castle … or did we …where was it? 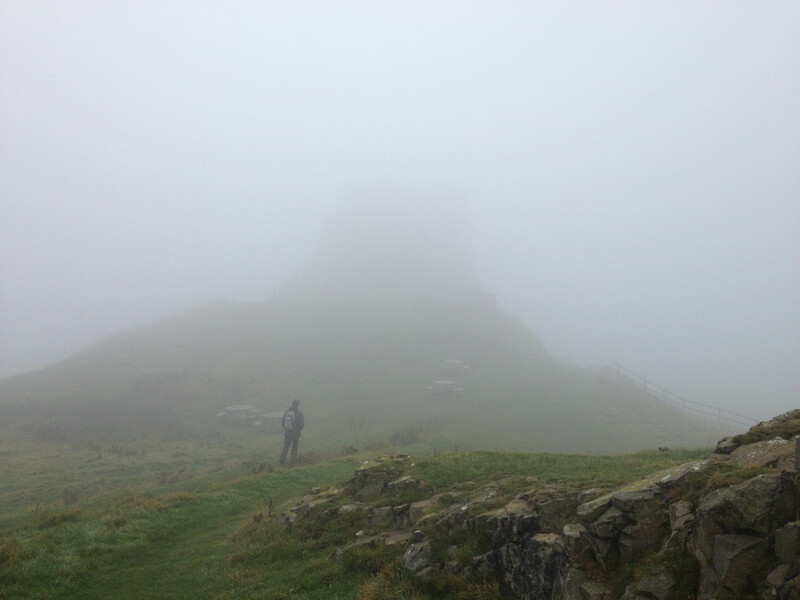 Never before have I seen (or not seen) Lindisfarne Castle like this! Curiously, it is even more magnificent glimpsed in fog. 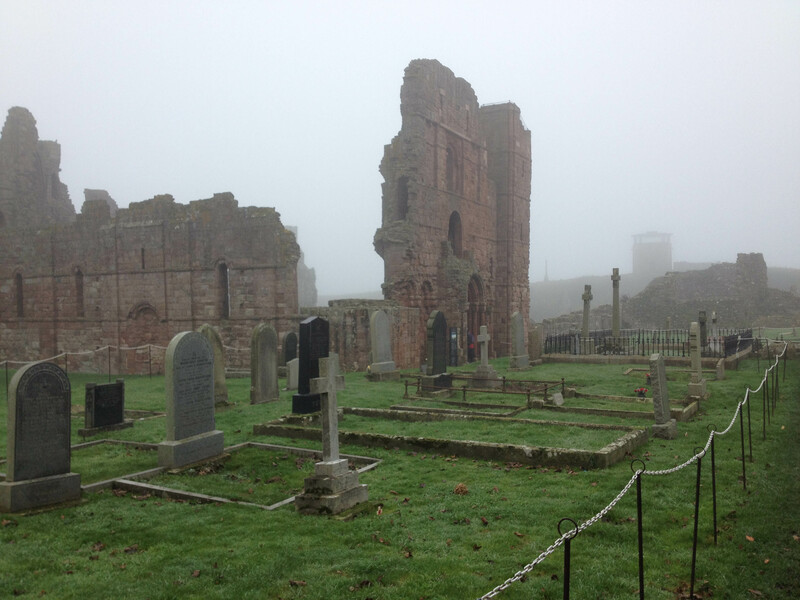 We couldn’t leave – on a day like this – without paying our respects at the Priory. Most disappointingly, it was shut, so we couldn’t get inside. Still plenty to see outside. Walking round the graves in the churchyard, you can’t help feel how appropriate the old festivals of All Saints and All Souls are for this time of year. Remembrance Day also falls in November, for the very good reason that Armistice Day, when the guns of the First World War fell silent, is on the eleventh day of the eleventh month. 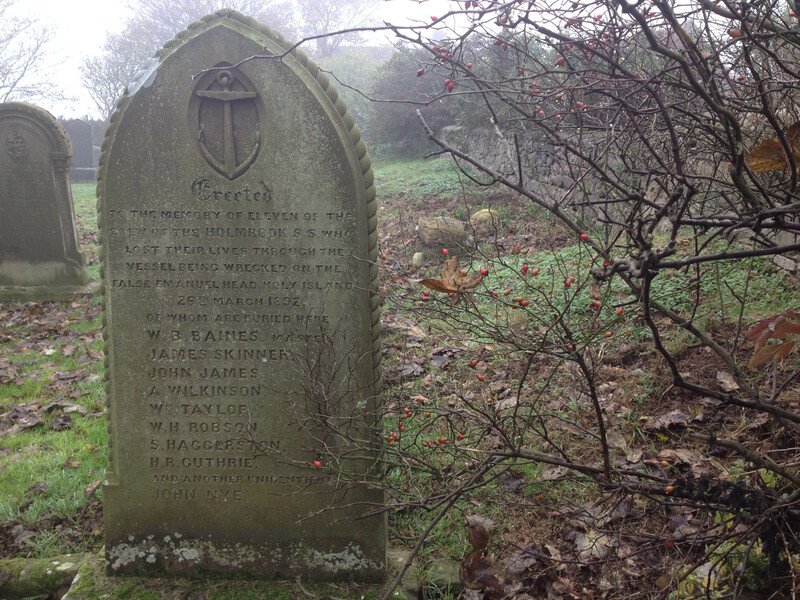 Here amid the grey mists and grey graves, it comes naturally to remember. These lost souls almost stood around us. Such an enjoyable walk – how very surprising! When we got to the pub for lunch, the few other tourists there were complaining about the weather: Such a horrible day! We knew better. * Misty moisty are technical weather terms of Stephen’s. I loved going on this walk with you! It felt like going back in time too, to the times when people really had no choice to avoid bad weather, but just had to get up and go about their business. I like all kinds of weather, but I can’t imagine myself back into a time where I couldn’t at least tune in to the weather channel and find out how much longer this fog was supposed to last, or what weather we should have tomorrow or in a week. Good for you to enjoy the weather and find nuggets of delight in it! Particularly liked the picture of Stephen on the endless beach. Well – I’m not sure we’d have gone out so positively if we hadn’t thought the weather was going to change and the sun come out!! 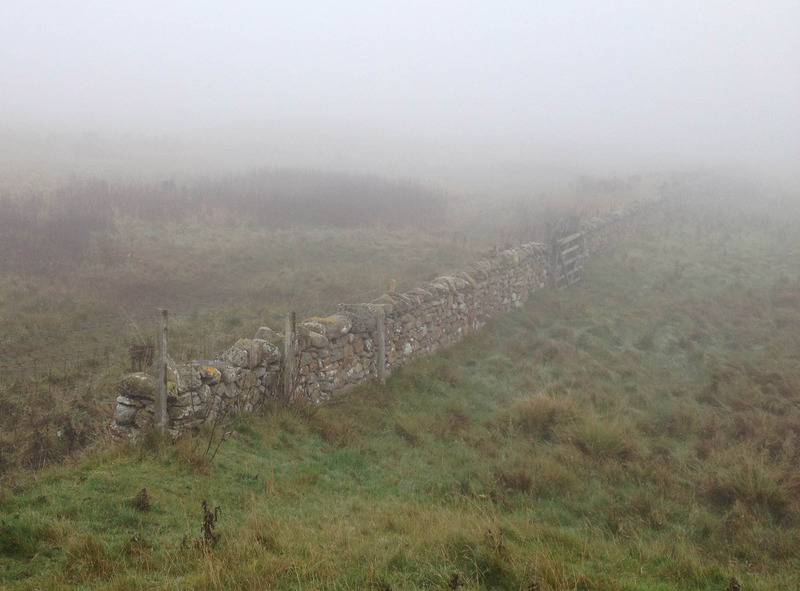 It really was very pleasant walking conditions – mild and still – just so foggy! I was quite afraid I’d lose Stephen at times. I too love walking in the fog and the ‘silence’ can be deafening 🙂 Makes one want to be very quiet and respectful of nature. Had such a walk just this morning but in hills. Too bad the dog found a skunk 🙂 Woof. Textile Ranger really brought up a good point re how we are always checking the weather, something others had no option to do. Funny how it works to say that silence is deafening…… yes, we too felt we should talk quietly. I had a chuckle about the skunk – gosh, I bet that smelt!! Wow! That is mystical looking mist…are you sure you didn’t wander into another dimension? Very other worldly. It felt a bit like another dimension, Rebecca – quite an other-worldly experience. I don’t think I’d want to go for walks like this all the time ……! Glad you liked the Rebanks book too, , Susan – and I’m interested to see that it’s being read in the States. Can’t beat a wander in the mist. I love the mystery it creates, even in a familiar place. I don’t think I’ve ever done such a misty walk before! 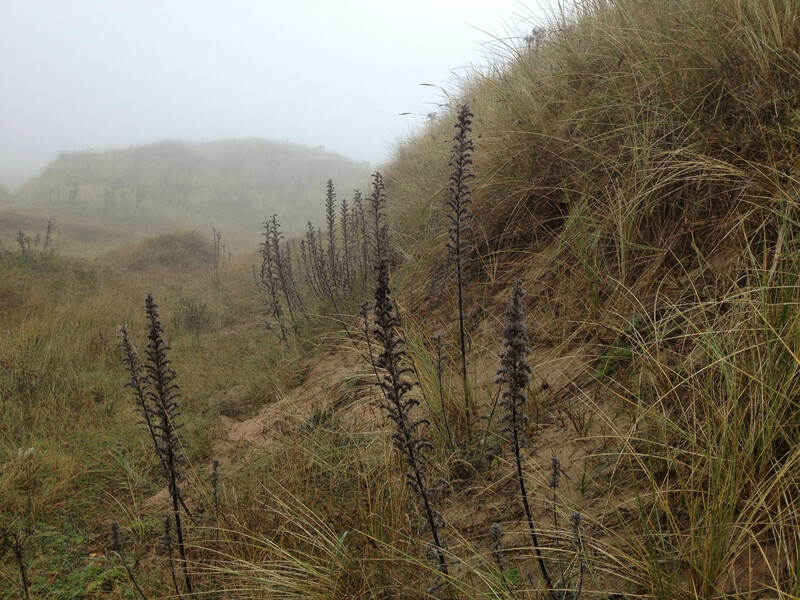 – and I’m not sure I’d have embarked on this walk had I known how misty it was going to be. But you are right – it was fascinatingly mysterious, even a walk we know very well.